We know that sometimes all-inclusive vacations are all what you need. Worrying about nothing but enjoying the beach and having amazing meals is just necessary, and in Costa Rica you can have all that. Here you will find adult’s only all-inclusive resorts, family all-inclusive resorts and some all-inclusive resorts located nearby incredible golf courses, so you can combine your vacations in Costa Rica with other activities you like. 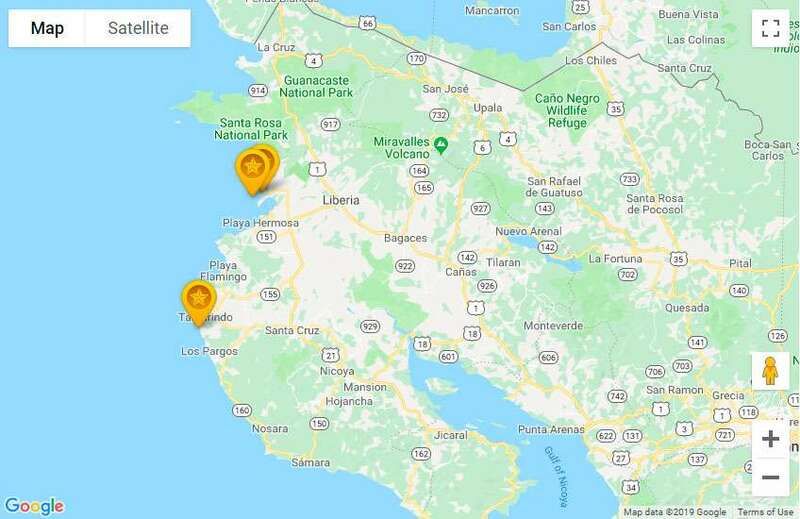 Most all-inclusive resorts in the country are located in Guanacaste province, nearby (LIR) Daniel Oduber - Liberia International Airport; although, there are some other all-inclusive resorts located in other regions of the country such as the Central Pacific. 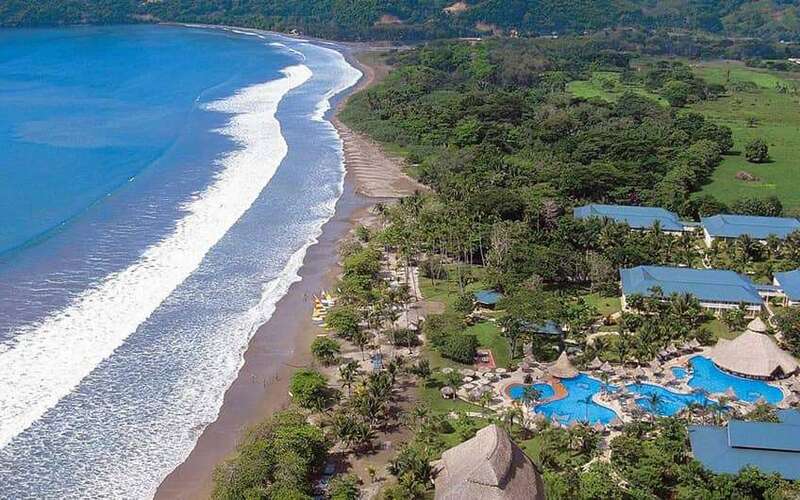 And as you may have heard, in Costa Rica there are also amazing beach resorts that are not all-inclusive but luxurious, offering amazing experiences during your days of leisure. Due to the climate that is very hot and dry during the summer, which usually lasts from December to April; and hot and humid during the rest of the year, almost everyone spends some beach resorts in Costa Rica during their vacations. Besides, in both, Central and Northern Pacific, the positive energy of the radiant sun, which shines long hours, combined with the hot temperatures, invites you to enjoy the warm waters and the great Pacific Ocean all year long. Featuring a beautiful setting on Playa Langosta Beach and next to Las Baulas National Park, the Occidental Tamarindo (its previous name was Barceló Langosta) features an outdoor swimming pool and spa. Each room offers Pacific Ocean views from its balcony. 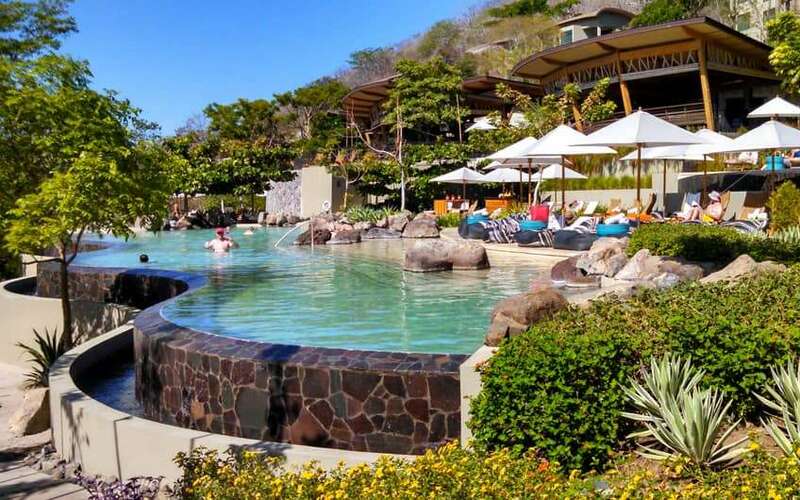 Occidental Tamarindo is the perfect resort in Guanacaste if you are a nature and beach lover, and it is also recommended as one of the best all-inclusive family resorts in Costa Rica. This property offers 193 Standard rooms, four Suites and one Master Suite; all the rooms are equipped with air conditioning, cable TV, telephone, mini bar, safety box and hair dryer; among other amenities. Occidental Tamarindo’s all-inclusive program includes three buffet meals a day, snacks, wine, beer and house liquors (foreign ones are not included), natural juices, soft drinks and bottled water. 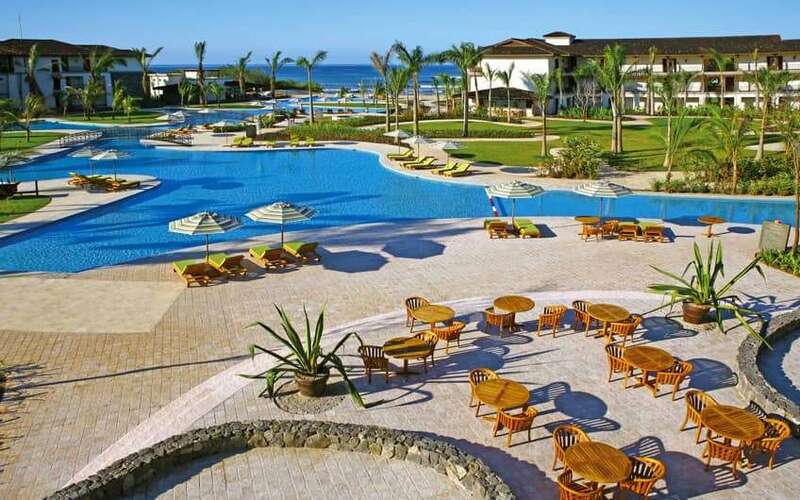 You can also enjoy the swimming pool, beach volleyball, dance lessons, aerobics, tennis courts, bingo café in the afternoon, entertainment and live music at night, Karaoke, Casino and Club. The resort has a Spa run by Aslan Clinic which offers different treatments and massages, a beauty salon and a fitness center. Additionally, the hotel has been awarded with the Blue Flag, which certifies the safety and cleanliness of its beaches. Secrets Papagayo Resort & Spa is located on the stunning Papagayo Peninsula, in Guanacaste province very close to Liberia Costa Rica. Perfectly situated on a serene hill surrounded by beautiful black volcanic sand beach, combined with a lush setting with beautiful views of the mountains and gardens, this Costa Rica luxury resort and adult-only hotel offers an exclusive, intimate and relaxing experience, under the concept of Unlimited Luxury®, an experience where everything is included and the wristband and the restaurant reservations are no needed. The property features 202 luxurious suites with views either of the gardens or of the Gulf of Papagayo and finely-appointed amenities. Additionally, the hotel offers a great selection of places to enjoy the most exquisite dishes; a cafeteria, four restaurants and five bars are the ideal spots for the delight of the guests. A Spa and a beauty salon, gym, gift shop, entertainment center, 24/7 room service, laundry service, business center, free Wi-Fi around the property, and a variety of activities during the day and life entertainment at night are only some of the facilities guests can enjoy during their stay. Besides, the hotel offers the possibility of upgrade this unparalleled experience with the Preferred Club program. Discover the all- Inclusive luxury resort The Westin Resort & Spa in Playa Conchal, where amazing beaches and lush forests combine with detailed service to offer you a 5-star all-inclusive family resort in Costa Rica. Nestled in the green forests of Costa Rica’s magnificent North-Pacific Riviera, Playa Conchal beach owes its name to its unique sand, comprising millions of finely crushed seashells. The resort offers 406 luxurious spacious suites with deluxe amenities and, if you are in the Royal Beach Club (adults only), you will enjoy preferential exclusive services such as assistance of personal Concierge Service throughout your stay, access to a private pool with Bali beds, pool concierge and bar service, exclusive breakfast and lunch service at the Royal Beach Club Restaurant Faisanela, preferential reservations for specialty restaurants, free pressing for up to two garments per person, private transportation in the resort grounds and complimentary Internet access throughout the Lounge and guest rooms. In addition, this top resort in Costa Rica offers a unique concept of “Family Concierge Club Service” that offers specially appointed Suites and the all-day assistance of a Family Concierge. Other benefits you can experience here to make your stay a more enjoyable one include a private area for breakfast, personalized mini-bar contents for kids adults, and children’s bathroom amenities kit, mini bathrobes and slippers. A great place to have some unforgettable Costa Rica family vacations. The beachfront hotel Casa Conde del Mar offers comfort and relaxation in a welcoming environment located in an area with one of the most pristine beaches in Costa Rica, very close from the International Airport, in Guanacaste. The beach where this Costa Rica resort is located receives the name of Playa Panamá, and also it has the Blue Flag certification and is categorized as one of the most sanitary beaches in the country. This beachfront property offers 20 double standard rooms, two mini suites and four junior suites, all with terrace, air conditioning, telephone, coffee maker, safety box, iron, ironing board and hair dryer. The hotel features two restaurants: the Mare Calmo, specialized in Italian food, and El Galeón, offering a variety of dishes. Guests can also relax in El Bucanero wet bar as they enjoy the swimming pool and the Jacuzzi. The services that guests can expect during their stay are room service, wireless Internet access in the lobby and restaurant areas, business center, laundry and dry-cleaning service, gift shop, refreshing pools, conference rooms, and parking lot for the visitors who rented a car and drove there by themselves. 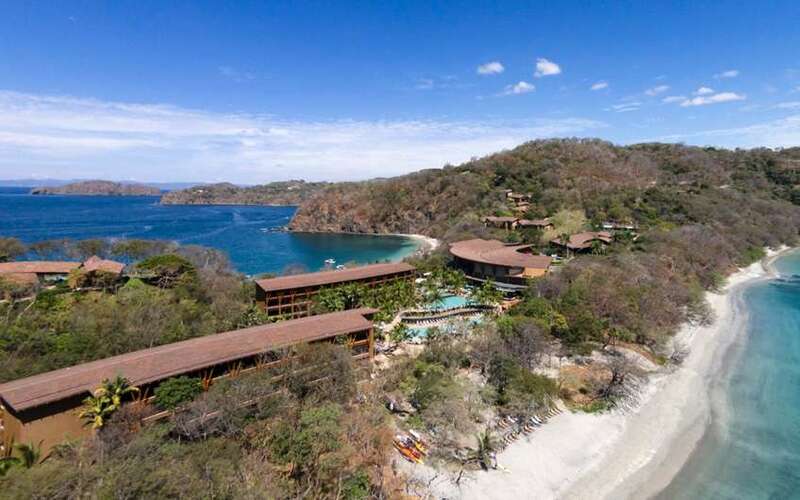 This luxurious all-inclusive resort is located in the rainforest, next to El Jobo Beach, at 17 km from Guanacaste National Park and 20 km from La Cruz City. The exclusive suites are equipped with free Wi-Fi, flat screen, dock for iPod or iPhone and coffee maker, plus terrace or balcony with jacuzzi. Some of them have sea views, direct access to the swimming pool, living room or dining area; The Club level suites have access to the Club Room. 24-hour room service is available. Food and drinks are complimentary and served in 7 elegant restaurants, 6 bars and a 24-hour coffee shop. There is a day spa, gym, kids club, several outdoor pools, sun terraces and a private beach. 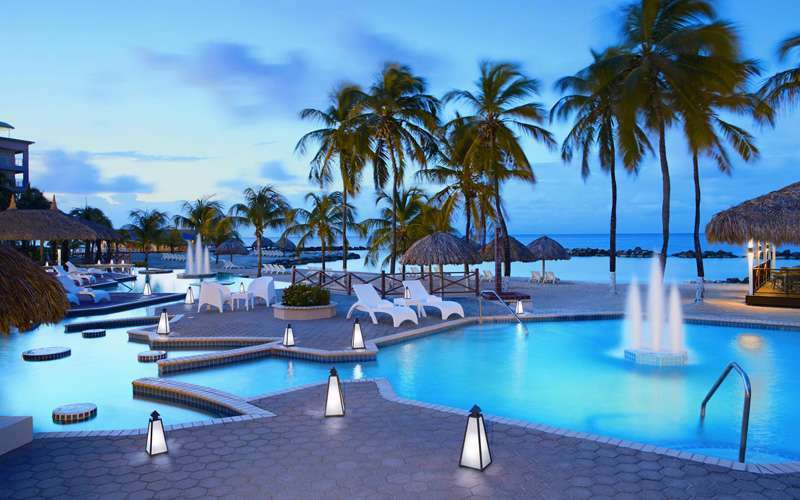 Everything is included in the all-inclusive experience with their Unlimited Luxury program. 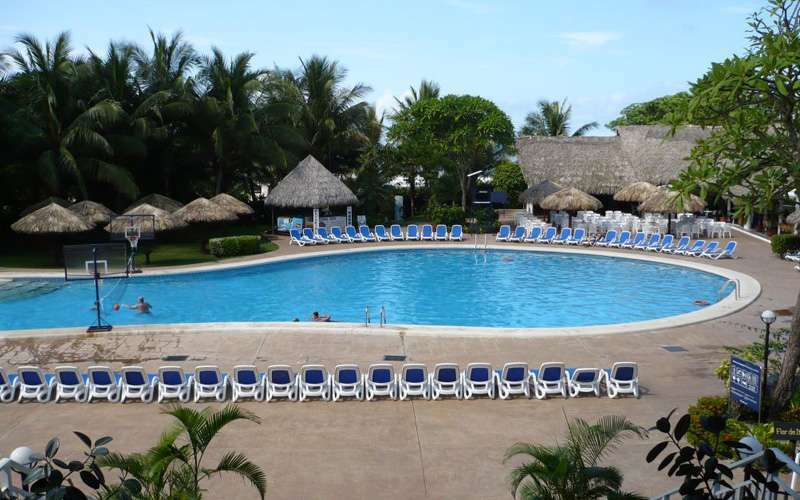 The all-inclusive resort, Barceló Playa Tambor is located in Bay Whale, Puntarenas, in the Pacific coast of Costa Rica. It is in front of Tambor Beach in Nicoya Peninsula but still being part of the Puntarenas province. 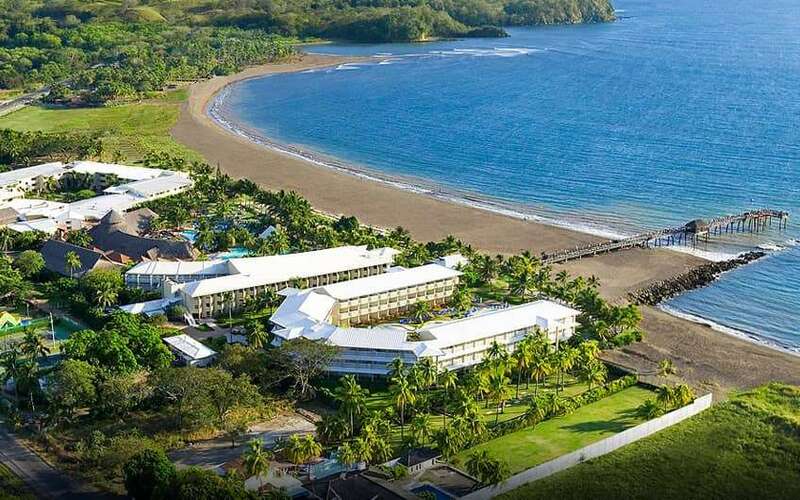 This all-inclusive Costa Rica resort has 402 rooms (some of them have terraces, others balconies) with air conditioning, cable TV, telephone, coffee maker, mini bar, safety box, iron, ironing board, bathroom with bathtub and hair dryer. Featuring all the right amenities to make more comfortable your stay at the beach. The hotel has two restaurants, three bars, swimming pool, gym, jacuzzi, casino, three tennis courts, souvenir shop, beauty parlor, business center, Internet access available for a fee, and parking lot. The bright, colonial-style rooms have a balcony with views of the gardens and the bay. A flat-screen TV, minibar, kettle and coffee maker are included. Suites also have separate living rooms. The hotel serves free food and drinks at various restaurants and bars, including a buffet restaurant and a poolside café. Other facilities include nightclub, children's clubs, 3 outdoor swimming pools (2 of them connected by a waterfall), sports courts, gym and spa. There are also live shows and a private airstrip. 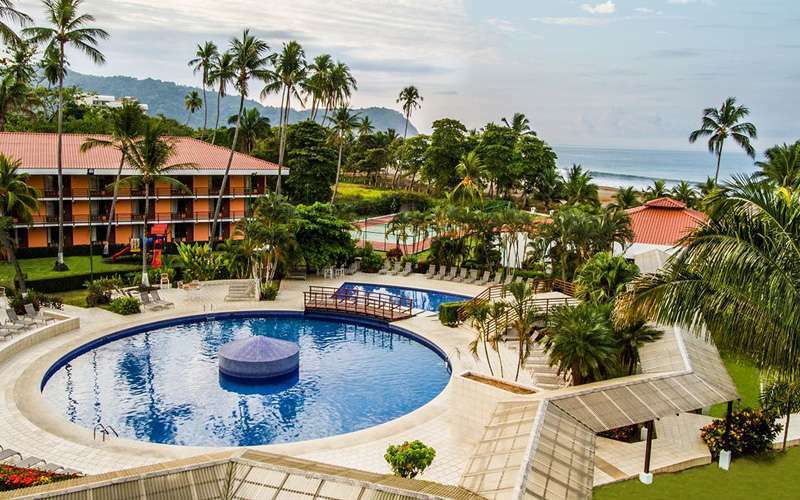 This beachfront all-inclusive resort in Costa Rica is located in Jaco Beach, a small city that offers visitors a great variety of restaurants, art, clothes, crafts & souvenir shops and an animated nightlife. The beach is very popular among the surf community. The Best Western Jaco Beach Resort boasts 120 beautifully-appointed guest rooms, each featuring special amenities such as free Costa Rican coffee for every morning. This beach resort also features unlimited food offerings from 6:30am to 9:30pm. Venues include: El Puerto Restaurant with relaxing views of the Pacific, El Muelle Beachfront Bar and El Almendro snack bar (hours vary at each venue). For entertainment, there are many fun daily activities for all ages, a large swimming pool for children and adults, a tennis and beach volleyball courts and a recreation room. This all-inclusive hotel features 314 rooms and each one is equipped with king or double Sweet Dreams® beds by Doubletree. Also, the guestrooms have terrace, wireless Internet, coffee table and chairs, plasma TV, temperature control in the room, iron and ironing table, safety box, coffeemaker and complimentary coffee, clock radio AM/FM with connectivity for MP3 and phones with double line. The spacious bathrooms include a tub or an individual shower and Neutrogena® bath amenities. During the stay at this all-inclusive Costa Rica resort the guest can enjoy a great variety of restaurants, tennis courses, and pools; as well as having the opportunity to access free Internet, wheelchairs if needed, meeting rooms and a business center, the gym, and also, they can take pleasure in the golf courses. The guests can bring their pets if they wish, the hotel allows pets under certain conditions. 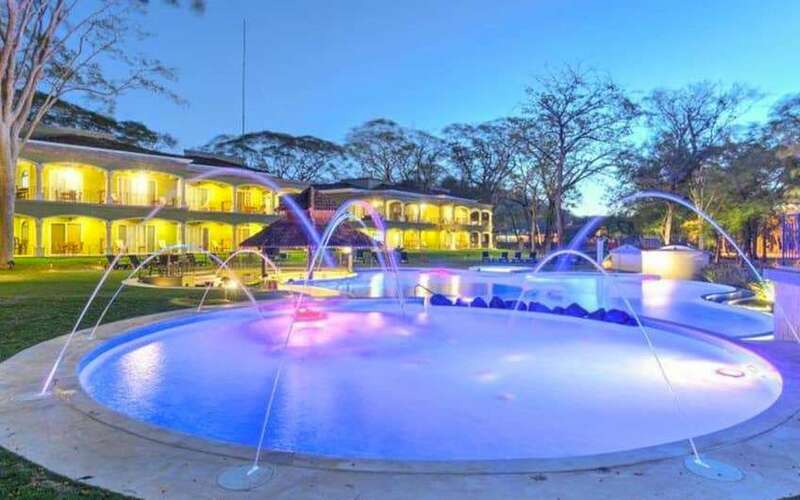 The proximity to the San José International Airport makes this hotel one of the favorites Costa Rica family resorts not only for foreigners but also for locals who love spending some quality time with their loved ones and enjoying the beautiful beach right in front the hotel. Live a truly Costa Rican hacienda-style experience in a rustic luxury beach resort in Guanacaste. JW Marriott Guanacaste Resort & Spa is located within the famous Hacienda Pinilla, a unique and sophisticated residential beach and golf community, facing the beautiful and secluded Mansita beach, only accessible to resort guests and residents. 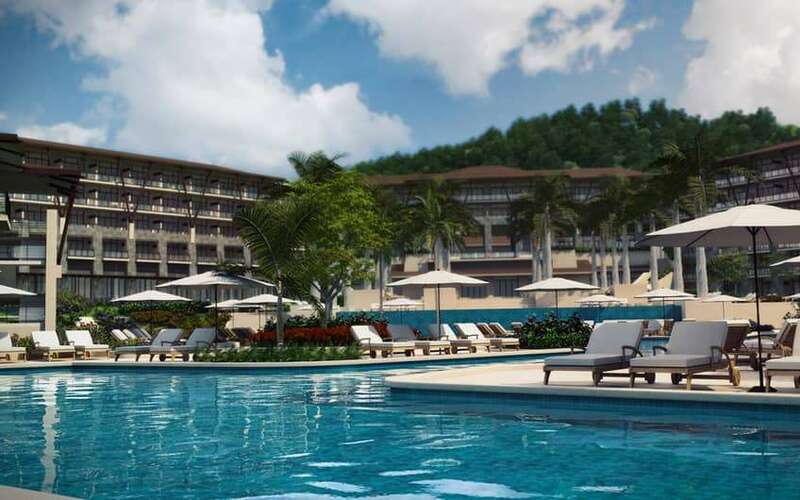 Featuring the largest pool in Central America, a fully equipped Kids Club and a luxurious Spa, this Costa Rica 5-star resort offers 289 guest rooms and 21 Suites. All of the rooms are tastefully furnished for comfort and convenience and offer the JW Marriott bedding concept (down comforters, custom duvets and cotton-rich linens). General room amenities include: air conditioning, individual climate control, iPod port and alarm clock radio, cable TV, DVD player, mini bar, bottled water, coffee maker/tea service, electrical adapters, iron and ironing board and safe. The Resort offers five restaurants to choose from: casual dining right on the beach in Azul Grill, Asian fusion cuisine in Tamarine, a Guanacastecan style steakhouse in Sabanero, a full buffet at Mansita Restaurant or relax ambiance with great beach and pool view at Nau Lounge and Bar. Challenging its guests is an 18-hole championship golf course that neighbors the resort, providing a breathtaking view of flourishing landscapes and the Pacific Ocean. Four Seasons is one of the top resorts in Costa Rica. It is located at the renowned Papagayo Peninsula; near the marina, the golf course and the heliport…to ensure guests a 5-star experience. The golf course is an Arnold Palmer, 18-hole, par-72 championship golf course and has been ranked among the "Top 100 Courses Outside the United States" by Golf Digest. Besides, the resort offers four restaurants specialized in Latin and Italian cuisine, and all of them use fresh local Costa Rican ingredients to create innovative menus that offer one-of-a-kind dining experiences. Located on the Peninsula Papagayo, this luxury resort stands quietly and almost imperceptible among the trees, overlooking the sapphire blue waters of Culebra Bay. Design by renowned Costa Rican architect Ronald Zurher, the first Latin American Andaz was inspired by the organic forms and shapes of the native flora and fauna. Andaz Papagayo´s free-flowing environment means: no desks, no formality and thus, no stress. Just to make you feel like you are arriving home. 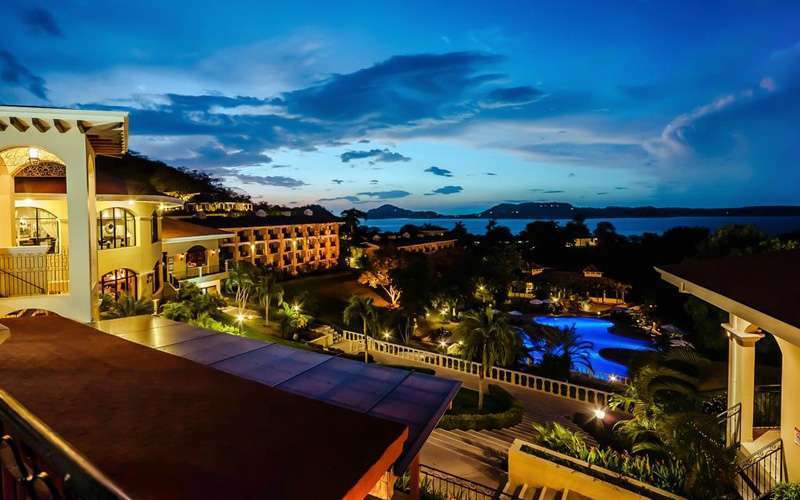 This Guanacaste Costa Rica resort features 153 guestrooms and Suites decorated with woven textiles, solid woods and carved artifacts highlighting the rich Costa Rican aesthetic. Each of them offer a spacious balcony with breathtaking views of Culebra Bay and the tropical dry forest. Four of the twenty-one Suites have plunge pools, while the Presidential Suite offers a private, full-size pool. Upscale amenities, a healthy-minded minibar and complimentary wireless Internet are available to all guests. Besides, three themed restaurants offer farm-to-table ingredients and locally inspired cuisine. This is a great alternative for your relaxed vacations in Costa Rica. If beach locations are what you are looking for to spend your vacations in Costa Rica, and if you don’t want to worry a lot about the little things then now you have the perfect options to include into your itinerary. Please do not hesitate to contact us if you want to receive some help while arranging your vacation plans, we will be more than glad to assist you and exceed each one of your expectations. 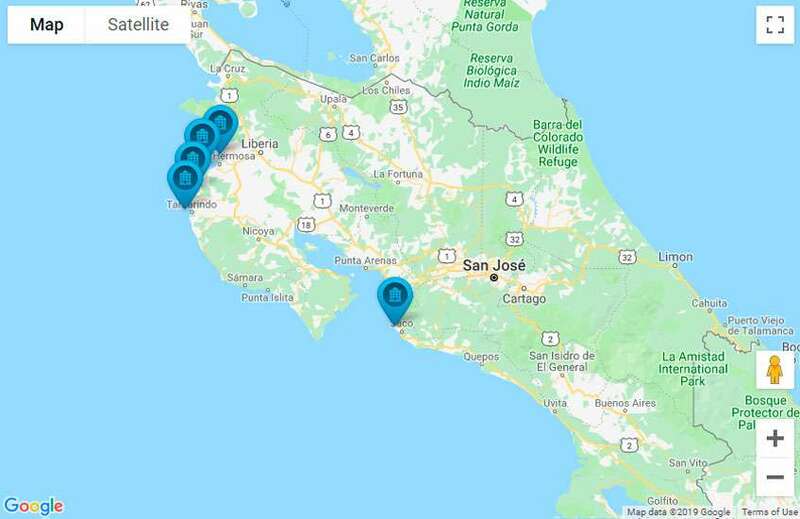 Check our Costa Rica map for all-inclusive resorts to know better were they are located and ease you the process of planning your next vacations.